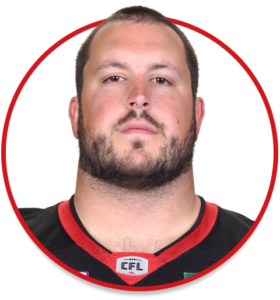 Alex Mateas is a Offensive Lineman currently playing for the Ottawa REDBLACKS. Chosen in the first round, first overall, in the 2015 CFL Draft … Signed by the REDBLACKS, May 22, 2015. Eased into pro game while re-adapting to Canadian football after five seasons in the NCAA, serving as a valuable reverse on one of the league’s best offensive lines. Started 29 games over a three-year career at Connecticut, including consecutive seasons of 12 starts for UConn in 2013 and 2014 … Entered the NCAA with Penn State in 2010 and was redshirted during the rookie season before transferring to UConn … Attended Merivale High School and played for the Marauders … Also played junior football for the Ottawa Sooners.